People tend to be of only one of two minds about pork: On one side there are those who claim pork is unclean (or traif) because of religious prohibitions or unhealthy because of the way the animal eats or is raised. On the other side are those who greatly enjoy “the other white meat,” including traditional cultures like the long-lived Okinawans and Caucasian Georgians who eat pork in some form almost every day. And then there are thousands of years of Asian, European (and later, American) farming history, where almost every homestead and farm had a pig or two to turn waste into fertilizer and food. So, religious prohibition notwithstanding (That’s between you and your Maker! ), is pork bad for you? Or is it a healthy, traditional food that’s an integral part of every self-sustaining homestead? Pork is one of the oldest sources of meat, and domestication of wild pigs has been documented as early as 5,000 BCE. Today about 38 percent of the world’s meat production is pork, although its consumption varies widely from country to country. This means a lot of meat, fat and fertilizer for little to no input, plus 99% efficient nutrient and waste recycling. The value of waste recycling to an off-grid, self-sustaining homestead in any era cannot be overestimated. Pork is also one of the most commonly eaten meats because it is much more easily preserved than other types of meat, due to its fat content. Salt curing pork into bacon, salami, prosciutto, ham, and the like is an old traditional method that goes back thousands of years before refrigeration. Marinating pork meat before cooking it is another traditional method used in preparing fresh pork, which both tenderizes it, and imbues it with more flavor. Traditional curing methods such as salt curing, smoking, brining, marinating and lacto-fermenting not only made the meat taste better and last longer, they also killed any parasites that might have been present. But even though we have modern refrigeration, and trichinosis is now almost non-existent in the U.S., the flavors that traditional curing methods create are why bacon, salami, etc. remain very popular meats today. Pork often gets a bad rap. But you may not know that pork is actually a good source of Vitamin C, niacin, phosphorus and zinc, and a very good source of protein, Vitamin B-12, iron and selenium. The more varied the pig’s diet and the more time it spends outdoors in the sun, the better its nutrition will be. Pork that has been raised on pasture not only tastes better than the flavorless pork produced on factory farms, but it is also more nutritious. Studies indicate that pastured pork has significantly more vitamin E and more omega-3 fatty acids than factory-farmed pork, making it potentially less inflammatory than high-Omega-6 factory-farmed meat. Pasture raised pork also contains a lot more Vitamin D and CLA (conjugated linoleic acid), which are potent natural cancer fighters. Pork fat, or lard, is not at all the health menace most people believe it to be. Lard is actually 45% monounsaturated fat—the same kind of fat found in olive oil. Lard also tolerates high cooking temperatures, it’s often recommended for frying and pie crusts because it makes things so light and flaky, and it has a long shelf life. Wow! Bring on the lard! When I buy any meat, how the animal was raised is most important to me. 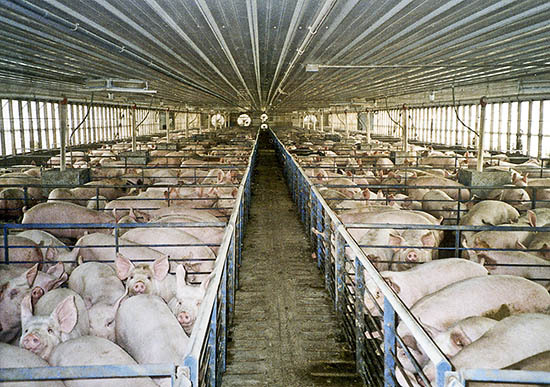 While I think that all factory farming is heinous, commercial pig farms are arguably among the very worst of all the concentrated animal operations. First, domesticated pigs are highly intelligent creatures, and have served as an integral part of homesteads and smallholdings for thousands of years. They are not suited in any way to the kind of indoor confinement, crowding and filth found in typical pig-farming factories. Second, the conditions in factory pig farms are so severe that commercial pigs are often given antibiotics, growth promoters and other pharmaceuticals just so they can make it to your table. It is thought that methicillin-resistant Staphylococcus aureus or MRSA, the highly virulent, flesh-eating staph infection that is resistant to antibiotics, originated on factory pig farms. Swine flu as well. Lastly, and perhaps worst of all, unregulated industrial hog manure lagoons pollute the air for miles, destroying ecosystems and quality of life for everyone living nearby. These lagoons can also pollute ground water and nearby wells, severely contaminate rivers during seasonal flooding, and sometimes even explode and catch fire as methane builds up in them. But not all pork is created equal. Industrial meat simply can’t hold a candle to traditionally produced meat for quality, accountability, sustainability, safety and taste. Fortunately, it is becoming easier and easier to find pasture-raised meat, including pork from pigs raised the way our ancestors raised pigs for thousands of years. Hands-down, the best way to buy pork is directly from a local farmer you know and trust, who has no problem letting you come by to see how their pigs are living. Before you visit, you should know that pigs eat some grass, clover and alfalfa, but they are not ruminants like cows, and naturally prefer a mixed, omnivorous diet of scraps, “slop,” eggs and dairy waste, acorns and beech nuts, rotting fruit, roots, tubers, grubs, insects, and other messy things they can root around and dig for with their snouts. Corn and soy are NOT ideal foods for a pig, even when they live on pasture, though some might be used as a supplement. 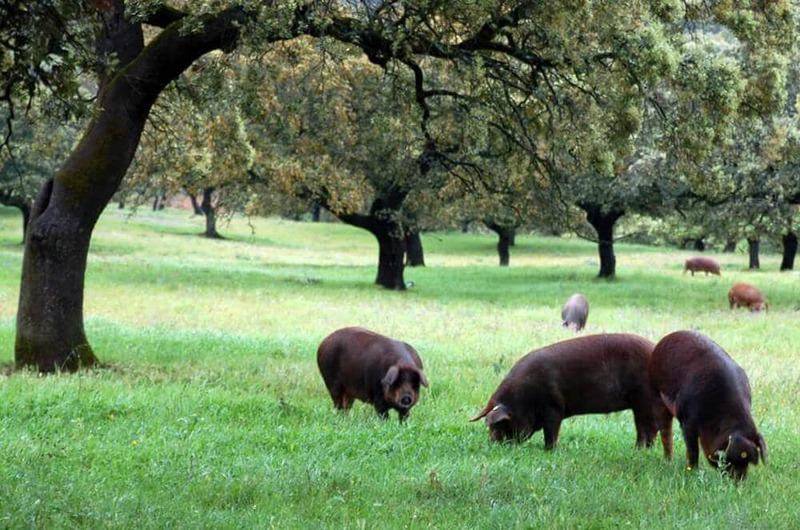 Pigs should ideally spend their good-weather days on polycultural pasture that offers some tree shade or light forest, where they can naturally forage. Buying pork directly from a local farmer you trust is also a great way to save money, since you can often buy a half or whole hog, have it butchered as you like, and packaged for your deep chest freezer. You can also enjoy the unique flavors offered by sustainable small farmers who are raising heritage pig breeds, or who offer farm-cured pork specialties, like local sausages and salumi. Animal Welfare Approved has tougher standards because they require access to outdoor foraging. Certified Humane pork does not guarantee that pigs spend any time outdoors, but does guarantee that pigs have “access” to the outdoors. This is similar to the standard for “free-range” eggs. USDA Certified Organic pork standards require that pigs be fed organic feed, not receive antibiotics, growth-promoting drugs or hormones, and have decent space, bedding and outdoor access. USDA Organic standards are less stringent than those of Certified Humane or AWA, but they’re still much better than conventionally raised, factory-farmed pork. injected with or fed unnecessary antibiotics and other growth-enhancing drugs that have been banned in other countries. Ew. It’s no wonder so many believe that pork is bad for you. Under these conditions, how could it not be? Many factory-farmed meat products are labeled “natural,” but this is very misleading. All the word “natural” means is that the pork, beef or poultry was processed without artificial flavors or colors. “Natural” refers only to how the meat was prepared after slaughter, not to how the animal was raised. Some health professionals believe that pork is a particularly inflammatory food. There is some evidence to suggest that this is true. However, most Americans do not eat pasture-raised pork (which is lower in inflammatory Omega-6s), nor do they prepare it using the traditional methods that we have used for thousands of years. I believe this makes a big difference. In China, it is thought that pork is bad for you unless it is cut into small pieces and marinated in vinegar before cooking in pork fat. Pork and pork fat together form the number one single source of calories in the traditional Chinese diet. Owning pigs is considered wealth, and a crucial component of sustainable rural subsistence even today. In Argentina and the Philippines, pork is traditionally marinated in vinegar. In India, pork is soaked in yogurt before seasoning and cooking. In Mexico and Central America, it is typical to marinate pork in orange or lime juice. And here in America, we have a long tradition of pickled pigs’ feet and vinegar-marinated barbecue. The key to properly preparing fresh pork lies in using an acid to marinate the meat prior to cooking. Vinegar, citrus, or yogurt provides the acid that breaks down the meat so that it remains tender and succulent—even after you cook it thoroughly for safety. Like brining and drying your nuts and seeds or soaking your grains in whey, marinating pork may also have the added benefit of improving its digestibility and reducing its inflammatory properties. This does not surprise me; our ancestors were pretty smart, after all. Whether cooking ground, chops, ribs, loins or roasts, you should always prepare an acid marinade for your fresh pork. This could be as simple as a 12–24 hour soak in vinegar and water (2:1), plus some sea salt, or it could be a more elaborate marinade with seasonings and spices to make dinner extra special. If you have a thick piece of meat or a roast, be sure to score it so the marinade can penetrate deep within. 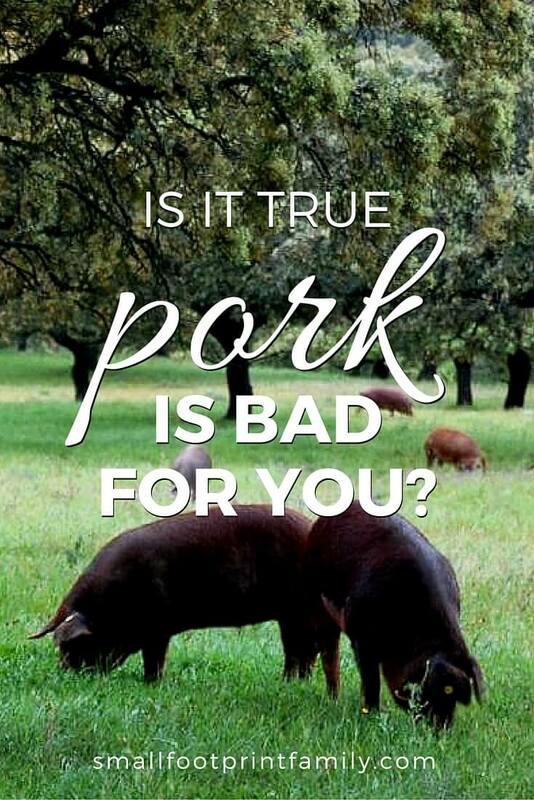 So, Is Pork Bad for You? If you choose pork from a local farmer that raises their animals on pasture or forest, and prepare it using traditional methods like acid marination, salt curing or lacto-fermentation, pork can be a healthy part of any real food diet. Many of your comments about commercial pork production are misinformed and/or outright lies. Will give you benefit of doubt as maybe you don’t know the difference. Please do provide concrete, primary-source evidence refuting the toxic manure lagoons, ractopamine and antibiotic use, and crowded, indoor confinement that is well-cited, linked and photographed in this article. I have yet to have a commenter adequately refute the links and references cited in this article. You calling me a liar doesn’t actually make me one. Have a good day, sir. I’m sure your comments are well intended. But some are factually incorrect and misguided. One being that commercial pork is “injected with large quantities of antibiotics, hormones and other growth-enhancing drugs”. There is zero hormone usage in pork production. No hormones have ever been approved for use in swine. Also no commercial swine are injected with large quantities of antibiotics. In fact, few commercial hogs ever receive antibiotics and those that have, received them under veterinary guidance, much like children who are sick. You really should visit a commercial hog farm. Most are family-owned (some say corporate-owned, but most of those corporations are family corporations). Hogs used to be raised outdoors in the U.S. midwest (think of Iowa and Nebraska in January…). Now those hogs are in climate controlled facilities with nutritionists and veterinarians on staff. Hogs have never had it better. Outdoor hogs are far more likely to acquire cholera and host of other diseases. In the past 50 years, the only hogs infected with cholera were backyard hogs. I understand that each consumer can choose their foods and how they are produced. But your information here is inaccurate, misguided, and slanders thousands of wonderful U.S. farm families. Antibiotics in feed and the usage of growth enhancers and beta-agonists like Ractopamine are common in factory hog farms. It is also well documented that hog farms are a major locus of the evolution of antibiotic-resistant bacteria. FDA-approval notwithstanding, my readers prefer their animal products without pharmaceuticals of any kind unless medically necessary. And then there is the whole issue of GMO feed, nursing cages, overcrowding, and perhaps most horrifying, the manure lagoons that come with factory hog farming. That hormones are not approved for swine does not make factory farmed pork any safer or better for the environment. If these family farmers you speak of are treating hogs and the earth so well, it should be no problem for them to become Animal Welfare Approved, or even certified organic. Spoken like a typical unfortunate low carb uneducated and misguided person who hasn’t discovered the masses of people living on carb dense diets for many many years who are disease free, disability free and drug free. Oops, this was meant for the coconut zucchini bread. Forgot that I read this afterwards. Nice and clear blogpost about pork! i absolutely love pork, but my husband clains that he doesn’t eat pork because pigs don’t sweat, therefore they are unable to get rid of toxic substances the way we as humans do when we sweat. do you have a take on this? Chickens and other foul don’t sweat either. Many animals shed heat by panting. This has nothing to do with their ability to process toxins from their body using their liver and other organs. Great article! I’ve had this conversation with my brother countless times. He’s a vegan, which is fine, but I don’t agree with him that meat is generally bad for human consumption. Great to see people spreading the word about what an ethical, ecological, and public health disaster factory farming is. The US Department of Agriculture (USDA) prohibits the use of hormones in the raising of hogs or poultry in the United States. Therefore all pork and poultry products that carry the “no hormones administered” label only represent the regulations that are already in place for pork and poultry and should not be taken to mean that the manufacturer is doing anything beyond USDA requirements for conventional pork and poultry products. But they are free to use plenty of other pharmaceuticals and toxic chemicals like ractopene and arsenic. Yikes! It’s always best to get your meat from a small farmer raising animals on pasture and forage, whose practices you can trust. Love the detailed information you give about pork, and the history. When I had ulcers, years ago, and didn’t want surgery, one of my foods for healing was pork because it is easily digested. But, as you say, it has to come from naturally raised and not penned in hogs and pigs. When I was a kid, we had all pastured animals. At the time, my dad had a farm, and with his degrees in Agronomy/Horticulture and Animal Husbandry, taught other farmers. So, I appreciate the history you give here. Our farm was in Rancho Boyeros, Cuba … 50 km from Havana. Now I know where to find good pork. Thank you. Up to now, I haven’t eaten much pork because I hate the way the animals are treated, let alone the poor quality of meat. I love the detail on pork here. We’re the type of family who really appreciates a good green smoothie and locally grown organic pork. Quality is a bug part of food choices as you mentioned. And taking the quality of life of the livestock into account is key for us. What a great and informational post! My son attends preschool on a farm, where they care for and raise (among other things) pigs. Anytime we have pork – he asks – is this from the farm, because I love having pigs from the farm… I think he is great he is learning where our food comes from (and how to raise it)! Ms. Lisa, the teacher, always explains to the kids that “if you can smell the animal [whatever animal] it is in a cage/pen/area that is too small.” It really made me think about any farm that I visit where animals are raised. That sounds like a lovely preschool. I wish all children had such an opportunity! Thanks for sharing! Note that unlike pastured raised beef which can be eaten medium rare, pork must always be fully well cooked before eating. thanks for this discussion. I was a little alarmed when I read in Nourishing Traditions that pork should be avoided, mostly because I love bacon. We only buy directly from farmers of organic free-range pork, so I guess we are getting the best possible pork and will keep eating and enjoying it!